New York City mixologist and cocktail book author Greg Seider makes most of his bitters, syrups and infusions from scratch. Here, three easy recipes for cocktail ingredients that you can bottle up as gifts for the cocktail lovers in your life. Seider is a master of bitters, syrups and infusions – most of which he concocts himself – so there are a million teeny bottles on his bars. 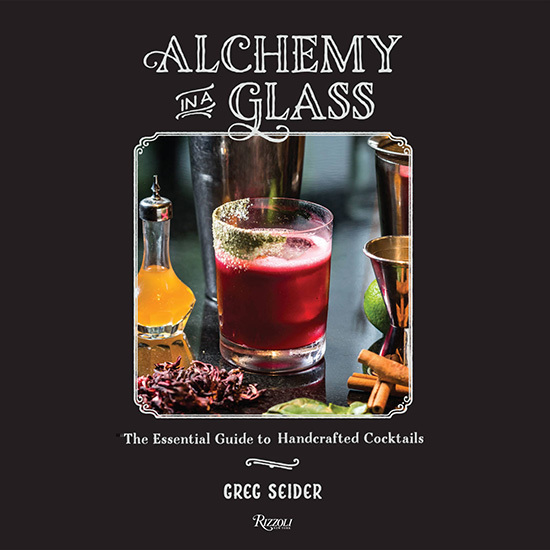 And lucky for us, he released an entire book of recipes, Alchemy in a Glass, just this year so that aspiring bartenders can try them out at home. This outstanding collection is a fantastic resource– and would make an awfully nice holiday gift itself. But in the spirit of creating gifts for our loved ones, we asked Seider for a few of his favorite recipes to bottle up and give away. He presented us with three different options: a bottled cocktail, a hibiscus cocktail syrup and his signature holiday bitters. Tie on a fancy little gift tag or slap on a homemade label and the holidays just got merrier. This variation on a Negroni is ready to drink on its own. Just pour over ice in a rocks glass. Mix all ingredients together and pour into a bottle, like a swing top flask. Makes one drink. *To make the Rooibos-infused gin, add 2 tablespoons of loose-leaf Rooibos tea to a bottle of gin and let it sit for at least 2 hours. Then, strain out tea. *For a whiskey-lover, substitute bourbon for the gin to make a riff on a classic Boulevardier. Seider’s hot-pink colored–agave syrup is spiced with cinnamon and gets a tang from hibiscus tea. It’s outstanding in tequila cocktails (or just mixed into seltzer water with a squeeze of lemon or lime for a non-alcoholic drink) and will keep in the fridge for 2 or 3 months. Mix 3 ¼ cups water with 3 ¼ cups of light or amber agave nectar in a medium-sized saucepan. Add ½ cup loose-leaf hibiscus tea (or 20 hibiscus tea bags and 3 cracked cinnamon sticks. Bring mixture to a boil and remove from heat. Let stand 30 minutes and then strain out the tea. Pour into 8 ounce bottles. Makes about 6 bottles. Add all ingredients to a cocktail shaker. Fill with ice. Hard shake for 8 to 10 seconds. Strain over ice in a rocks glass. Makes one drink. These bitters take a couple weeks to infuse, so start this project this weekend in order for these gifts to be ready for the holidays. A bottle of these will last indefinitely, depending on how often you make drinks. They’re great in a Manhattan. Wash the oranges and peel them, removing as much white pith as possible. Add the peels and the rest of the ingredients to a large mason jar and keep, unrefrigerated, in a dark place. Shake the mason jar once a day to infuse flavors. Taste the bitters after 7, 10, 14 days until the desired flavor is achieved. Strain out the peel and spices and pour into bitters bottles. Dark-colored bottles keep the flavors fresher longer. Makes eight 4-ounce bottles. *Seider prefers to use organic spices when available. These spices can be found in most grocery stores, but to ensure freshness, Seider buys them here.